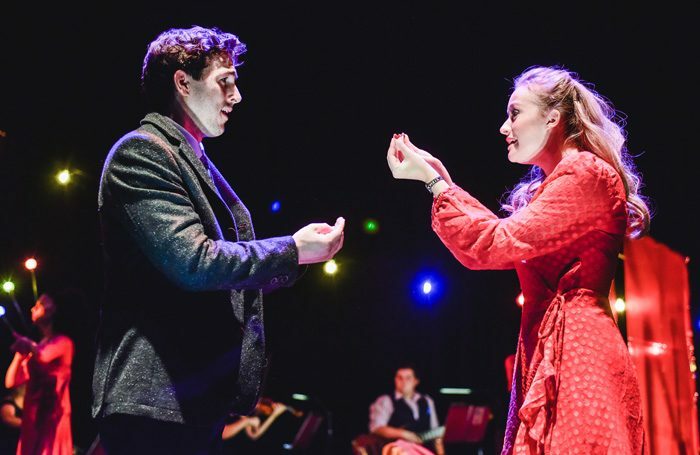 Jason Robert Brown’s glorious 2001 musical, exploring a couple’s passionate yet doomed relationship from each partner’s perspective, has seen a number of recent revivals in the UK. Since 2015, there have been productions in Belfast, London and Edinburgh. None of those, however, will have looked or felt quite like this exhilarating Welsh premiere directed by Angharad Lee. Lee’s company, committed to promoting diversity in theatre, creates a version of Brown’s show that is as visually compelling as it is musically, utilising two D/deaf dancers, Raffie Julien and Anthony Snowden, choreographed by Mark Smith. The dancers play the more physical alter-egos of our tragic lovers Cathy and Jamie, simultaneously played and sung by Lauren Hood and Michael Hamway. The company’s choice is not a gimmick. Hood and Hamway, and David Laugharne’s small band, are superb and this remains a poignantly rendered song-cycle. But the addition of dancers provides us with a physical manifestation of the lovers’ pain, as well as plenty of humour when they riff playfully with their vocal counterparts in more upbeat moments. Becky Davies’ design is sparse but cleverly arranged, with a moment when the dancers find themselves trapped behind coloured screens especially affecting, unable to break through during the show’s heart-breaking final scenes. This is a high-concept musical that plays with time-threads and miscommunication. Lee’s decision to create an additional layer to what is an already complex structure is a courageous one, but it pays off wonderfully.